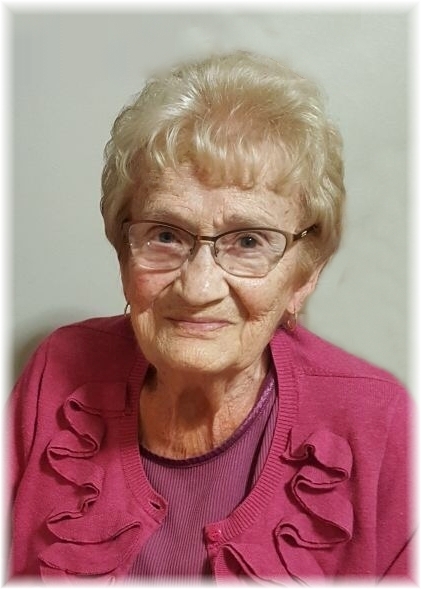 On December 2, 2018 Stella Margaret Garlinski (nee Korney) age 92 passed away peacefully at the Dauphin General Hospital. Stella was born in Dauphin, MB on January 6, 1926 to Harry and Sophie Korney. Stella was the fifth of ten siblings. Stella married Ignace Garlinski and enjoyed 66 years of marriage. They were blessed with four children, Lorraine Garlinski, Bonnie Carmichael (Blenis - deceased), Gary Garlinski and Donald (Colette) Garlinski. There are eight grandchildren, Kristin (Brian), Paul (Taryn), Shauna (Ken), Jennifer, Sara, Kerri-Lynne, Shannon, Chantal (Duncan); seven great grandchildren, Nicholas, William, Savannah, Maxine, Alexandra, Maximillion and Oskar. Stella is survived by sisters Caroline Barton, Alice Boychuk, Ruth Komarnicki and sisters-in-law Ruth Garlinski, Wilma Korney and Olga Saramaga. She was predeceased by her parents, husband Ignace, siblings Marie, Anne, Helen, Mike Peter and Frank. A Funeral Mass was held for Stella on Friday, December 7, 2018 at 11:00 am from the St.Viators Roman Catholic Church in with Father John Legitimas officiating.